Have more questions? Check out the FAQs or Contact Us. Are you interested in our XAT Decision Making Coaching Course? As a part of our online course, we have solved all previous year XAT Decision Making Questions on video. Not only we provide answers to the old XAT Decision Making Questions in those videos but we also explain the logic behind those answers. These detailed solutions are a must for any students looking to score more in the Decision Making section of XAT 2019 exam. Q1: What is Decision Making with respect to XAT 2019? Ans – Decision Making is one of the four sections in the XAT 2019 exam. Q2: What are the XAT Decision Making questions based on? Q3: Is Decision Making important for XAT exam? It is very important. Marks from Decision Making will be counted towards calculating the results and percentile for the XAT exam. Q4: How many questions will be asked in the XAT Decision Making section? It is expected that there will be 22 questions for Decision Making out of a total of 75 questions in the XAT 2019 exam. Q5: What is the typical cutoff in XAT Decision Making? Q6: What is a good score in the XAT Decision Making? 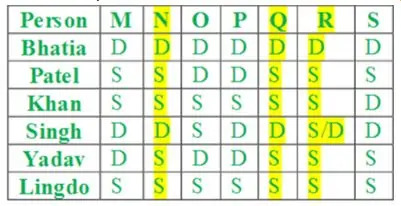 Q7: Is there negative marking in XAT Decision Making? Q8: How much time should be allocated to attempt Decision Making in XAT 2019 exam? 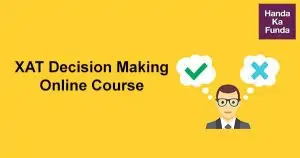 Q9: When should you attempt Decision Making in XAT 2019 exam? Ans – In the beginning. It is the most scoring section. It is the easiest section. It should be done first. Q10: How many questions were asked in Decision Making in previous year XAT exams? Q11: Are Decision Making questions easy or tough to solve in the XAT exam? Ans – Traditionally, Decision making is the easiest section in XAT exam. If you look at the sectional cutoffs for the three main sections – cutoff for Decision Making section is always the highest. Most people who get calls from top colleges like the XLRI – do really well in the Decision Making section. The Decision Making Ability section, that houses about one-third of total questions which determine your percentile, can make the difference of between shortlist and rejection. Understand why is it even asked in the XAT exam. Questions based on Ethical Dilemmas are quite popular in the Decision Making section because Ethics is becoming the cornerstone of any MBA education program, with cases like Enron becoming commonplace. In this post we discuss some of the steps that a XAT aspirant can take to answer the questions based on Ethical Dilemma in the XAT Decision Making section. A lot of XAT Decision Making questions are just a combination of Logical Reasoning and Reading Comprehension. Those are the skills being tested. If you have solved questions on Analytical Reasoning while preparing for exams like CAT, you should be able to apply the same tactics in solving Decision Making questions. We discuss them in this post. 1) Who are likely to face monetary loss or make financial gains in the process? 2) Is there a particular societal sect that may be directly involved/impacted? We discuss this and a lot more about identifying the key stakeholder interests for Decision Making questions. Take an interactive mock test for XAT Decision Making section to see where you stand. Correct answers are also given with these questions. The easiest way to crack XAT Decision Making Section is to go through XAT Decision Making previous year papers. To make it easy for students, I decided to put all the previous year papers of XAT Decision Making. Answer questions 1-3 on the basis of information given in the following situation. Sayed feared Palani’s transfer may pull down the performance of the branch, as he felt Palani was transferred due to his poor performance in the previous branch. Q. 1. Which of the following information will most likely assuage Sayed’s fear? In the past 12 years as the head of branch, Satyender has exceeded targets every time. Palani has been a top performer in the organization; his performance has deteriorated only in the last three years. The branch’s performance has been good for the past 10 years; Sayed has joined the organization 3 years back. When Sayed joined as a fresher in this branch, others in the branch had feared that he might bring down the performance of the branch. While calculating the branch’s performance, the branch head has the choice to exclude new joinee’s performance. Three months later, Palani submitted local travel bills to Satyender for reimbursement. Satyender realized that the bill amount was 30% higher than expected. Q. 2. Which of the following options, if true, will enable Satyender take a decision that shall set a precedent, which is least likely to be misused in the future? Satyender is allocating territories to his subordinates for the coming financial year. So far, Palani’s performance has been poor and this allocation will decide his future in the organization. Q. 3. Which of the following information will be the least useful to Satyender in taking a fair allocation decision? Answer questions 4-6 on the basis of information given in the following situation. Lal & Sons, a family business, comprises three different companies in three different industries. Sudarshan Lal was heading this entire business from the inception. Two years ago, he hired three managers, one for each company and Chhaganlal Jha as Chief Executive Officer (CEO) to look after the entire business. These three managers are reporting to the CEO. However, Sudarshan Lal and his family still own the entire business, though they are not involved in day to day operations. Two years after the handing over, Sudarshan was concerned that none of the companies, except one, is profitable. Q. 4. Which of the following information, if true, will most likely reduce Sudarshan’s concerns? (A) A leading financial institution recently advised its investors to purchase the shares of the two loss making companies with a long term outlook. (B) The Corporation’s performance was stagnant for three years, before Sudarshan handed it over to professionals. Some of the senior employees who left Lal & Sons in recent past have complained to Sudarshan that the long cherished values of the organization such as respect for elders, job security etc. are being compromised. Q. 5. Which of the following options, if true, will indicate to Sudarshan that the employees are misleading him? (D) The replaced senior employees had only 4 more years of service and were not compensated for the pre-mature termination. Chhaganlal Jha, the CEO, was certain that someone in his leadership team was leaking information to Sudarshan Lal, well before Chhaganlal communicated. Q. 6. Given the following options, how best should Chagganlal Jha respond to this situation? (C) Chhaganlal should request his team to continue passing information, since it brings down the communication barrier. Answer questions 7-9 on the basis of information given in the following situation. Rose is the Queen of Kingdom A and Emily is the Queen of Kingdom B; both share a common border. They also share a border with Kingdom C, a much larger kingdom, ruled by King Jonathan who has expansive ambitions. Though individually their armies were no match to his might, together their armies were more powerful than King Jonathan’s army. Jonathan’s kingdom also bordered Kingdom K on the opposite side, making Kingdom C a buffer state between Kingdoms A, B and K. Kingdom K is ruled by King Summer Sault, who united a group of warring and belligerent tribes under his aegis. Kingdom K and Kingdom C had continuous skirmishes with each other. Jonathan realized that he has limited arms and ammunition to fight on all the three fronts simultaneously. Therefore, he planned to double the arms and ammunition which will take a few years. When this news reached Emily and Rose they held a secret meeting to discuss the situation. Q. 7. Which of the following actions, by Emily and Rose, will be the best suited to delay Jonathan’s plan? (A) Emily and Rose should send arms and ammunition to Summer Sault for the next few years. (B) The two queens should meet Jonathan and attempt to sign a peace pact. (C) Emily and Rose should also double their armies. (D) Emily and Rose should attack Jonathan immediately. (E) The two queens should ignore the news. Jonathan aims to invade and annex Kingdom K once and for all. Q. 8. Which of the following options will best enable him to accomplish the ambition? (A) He should request the cooperation of Queen Rose and Queen Emily. (B) He should sign a peace pact with Queen Rose and Queen Emily. (C) He should try and create a rift between the two Queens. (D) He should secretly invest in doubling his army, by reducing all other expenditure. (E) He should attack all three kingdoms simultaneously, giving them no time to cooperate. King Summer Sault was growing tired of the warring tribes, who slowed down the overall economic development of Kingdom K.
Q. 9. Which of the following is the best option for King Summer Sault to focus on economic development? (A) Align with Jonathan to eliminate one or two of the tribes and instil fear in others. (B) Align with the two Queens to eliminate a few tribes and unify the rest. (C) Design annual economic plans, with each plan named after a different tribe. (D) Create a rift among the tribes and instigate a civil war. (E) Request Jonathan to send teachers, doctors and artists to improve economic development of Kingdom K.
Answer questions 10-12 on the basis of information given in the following situation. Ava is the CEO of Ratan Brothers, a bicycle manufacturing company. The organization is doing well financially, with a steadily increasing share price. Recently, Ava promoted Bhushan, her nephew, to the position of head of procurement after he completed five years in the organization. After the promotion, he was automatically inducted into the quality council headed by Ava. Dev and Sons is a supplier to Ratan Brothers. It supplies “ball bearings”, an important part of any bicycle. After Bhushan took over, he switched to a new supplier citing quality deficiencies in Dev and Sons’ product. Dev and Sons responded by publicly declaring that quality was not compromised. Further, it alleged that its competitor bribed Bhushan to get the contract. Post this public allegation, the share price of Ratan Brothers started falling. Q. 10. Which of the following is the best option for Ava to immediately stem the falling stock prices? (A) Fire Bhushan, blacklist Dev and Sons and inform the press. (B) Issue a press statement that a committee has been formed to look into the matter. (C) Issue a press statement that the company’s quality standards have increased and that anyone is welcome to scrutinize the relevant documents. (D) Cancel the remaining order and call for a fresh tender. (E) Do nothing, as Bhushan, as the head of procurement, has the right to decide on the supplier. Under pressure from media and suppliers, Ava constituted a cross-functional committee of senior executives to investigate Dev and Sons’ allegation against Bhushan. The committee exonerated Bhushan. However, rumors within the organization began to spread that the decision was influenced by nepotism. Q. 11. Which of the following should be the best response from Ava? (A) Do nothing, as the committee has exonerated Bhushan. (B) Force Bhushan to resign temporarily. Make an independent enquiry, if found innocent, reinstate Bhushan. (C) Communicate to all shareholders that these kinds of practices are very common in organizations. (D) Sack all those employees who questioned the authority of Ava. (E) Explain in a town hall meeting, open to all the employees, how the decision to exonerate Bhushan was taken. A few months after the issue of Dev and Sons, a vigilance committee discovered some financial irregularities attributable to Bhushan in his earlier stint as a senior manager in marketing. The board of directors was concerned about this and demanded a response from the CEO. Offer to resign from the post of CEO, since as the CEO she is ultimately responsible for everything in the organization. Sack Bhushan immediately and make the reason public. Have a town hall meeting with all the employees and deny any financial irregularities in the organization. Communicate to the board that as the CEO, the organization’s financial health is her top priority, on which she has delivered stellar performance in the last five years. Inform the board that Bhushan was promoted because his initiatives helped the company immensely. Q. 12. Which of the following sequence of actions is the most appropriate for Ava? Answer questions 13-15 on the basis of information given in the following situation. Q. 13. 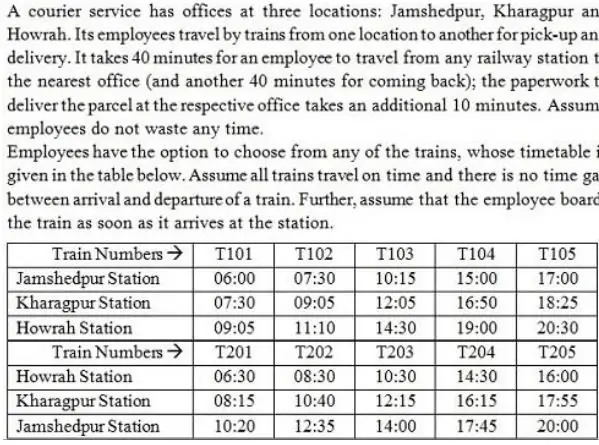 What will be the minimum time required to deliver a parcel at Kharagpur office from Jamshedpur station and come back to Jamshedpur station? An employee, starting from Howrah station, has to deliver one parcel at Kharagpur office and another parcel at Jamshedpur office. His task starts the moment he boards the train at Howrah station, and gets completed immediately after delivering the second parcel. Q. 14. Which of the following trains should he board at Howrah station to minimize the time required to complete his task? An employee, starting from Kharagpur station, has to deliver one parcel at Howrah office and another parcel at Jamshedpur office. His task starts the moment he boards the train at Kharagpur station, and gets completed immediately after delivering the second parcel. Q. 15. Which of the following trains should he board at Kharagpur station to minimize the time required to complete the task? Answer questions 16-17 on the basis of information given in the following situation. Three persons, A, B and C, lived on an island hill. A lived on the top of the island hill, B occupied the middle portion of the hill and C occupied the bottom of the hill. The top of the hill received good rainfall, the main source of water in the hill, though this portion of the hill had few trees. The middle of the hill however was lush with trees offering timber. The bottom of the hill had a good amount of stones and sand. A, B and C assessed their wealth in terms of ownership of timber, water, stones and sand available in the island hill only. During heavy rains, stones and sand from the top and middle portion of the hill rolled over to the bottom. When the rains stopped, both A and B claimed that some stones rolled down from their lands to the land occupied by C. They wanted the stones back. But C argued that rolling down of stones is a natural process. All three approached a wise man for the settlement of the ownership dispute. Q. 16. Which of the following is the best option available for the wise man? (A) Award ownership of stones to A. (B) Permit A to build a dam so that B and C are deprived of water. (C) Award ownership of stones to C, as stones rolled down naturally. (D) Award equal rights to all three over all the resources. (E) Award A, ownership of water and C, ownership of stones. Six months later, the three realized that the solution offered by the wise man in the previous question wasn’t working to the satisfaction of all, because it did not help them find the appropriate value of resources. Therefore, they reverted to status quo ante. After one year, all three of them wanted to construct a house each, on their respective property. Three types of resources – 1.Timber, 2.water and 3.stone & sand – were required to build a house. While each had one resource in abundance none of them had all the three in sufficient quantity. They still could not come to an agreement on how to fairly value and use each other’s resources to construct the house. They again approached the wise man for advice. The governing body of the United Federation of Islands, of which the island hill is a part, should take ownership of all the three properties and construct houses for the three. Each person should own one third of each of the resources. The three persons should arrive at the value of resources by trading the resources among them. Q. 17. Which of the following is the most appropriate in the best interests of A, B and C? Answer questions 18-19 on the basis of information given in the following situation. Ramesh, the owner of an auto-component manufacturing company in Sanand, had just returned after attending the funeral of his employee, Pankaj Kumar, who had died of cancer at the age of 35. Pankaj was a hardworking and sincere employee with impeccable performance record. Pankaj was the sole bread earner for his family with negligible savings and was survived by his wife and two school going children. His wife will get around 8 lakh rupees accrued to Pankaj as social security benefit. A large number of employees wanted the organization to employ Pankaj’s wife on compassionate grounds so that she could support her family. Though Ramesh was sympathetic to the demand, he realized that this could set a precedence, where the organization will have to provide jobs for everyone with similar conditions in the future. In fact, only recently, Ramesh had refused a request for a job to the daughter of an employee, who had died a few months before he was to retire. Create a fund to take care of immediate family expenses. Finance the school and college education of his children. Sponsor the vocational education of his wife and subsequently help her find a job. Purchase insurance for all the family members. Request all employees of the organization to contribute towards the welfare of the family. Q. 18. Which of the following options, from the above suggestions, will be the most sustainable for Pankaj’s family? Ramesh, along with senior managers, was in the process of designing a policy to deal with such issues in the future. Q. 19. Which of the following policy statements will be the least amenable to misuse in the future? (A) The firm should provide one job to any of direct dependents of the deceased employee. (B) The firm should provide one job to any dependent, if employee dies during the service. (C) The firm should provide one job to any dependent, if the family does not have any other support and employee dies during service. (D) The firm should provide help to the dependent family members in pursuing good education and employment. (E) The firm shall constitute a committee, with fair representation from all stakeholders, to decide on the course of action based on specifics of the case. Answer questions 20-21 on the basis of information given in the following situation. Madhuri Apte, a busy professional, rents out her studio apartment located in South Mumbai. Since she stays three hours away from the studio apartment, she uses a networked digital lock to monitor the property remotely. Each customer gets a temporary and unique access code for the digital lock that enables them to enter the studio apartment for the duration of stay. The apartment’s entrance door can also be opened with physical keys and Madhuri Apte has two such keys in her possession. Madhuri Apte has employed a cleaner who has a permanent access code to enter the apartment for cleaning every day. She is available only between 15:00 hrs and 17:00 hrs. Madhuri Apte’s apartment caters largely to international customers. A customer typically stays for 3 days, paying an average rent of $125 per day. While Madhuri Apte’s studio apartment gets good feedback on other aspects, many seem unhappy as they found the operation of the digital lock complicated. Q. 20. Which of the following options is the best for Madhuri Apte in this context? (A) Madhuri should switch to a physical lock. (B) Madhuri, on request, should send one of the physical keys five days ahead of customer’s arrival at an extra charge of $75. (C) Madhuri should request the cleaner to explain the working of the digital access code to customers for an extra charge. (D) Madhuri should do nothing as digital locks shall be the norm in the future. (E) Madhuri should create a video manual on “how to use the digital access code” and e-mail it to the customers before their arrival. Madhuri’s apartment received good feedback from the guests, except with respect to the operation of the digital lock. She decided to leave a spare physical key in the house for her guests. Recently some of the guests had forgotten to leave the key behind during checkout. Making a spare key will cost $500 and will take about 10 days to arrive. She was confused if she should continue leaving the spare key and was looking for a way out. Q. 21. Which of the following would be the best way out for her? (A) Keep Digital lock as the only option and communicate to customers. (B) Be present during checkout to ensure the key is returned. (C) Request the cleaner to be present during checkout. (D) Send polite reminders to guests before checkout date and on the day of checkout to leave the key behind. (E) Charge security deposit of $100 which will be forfeited if the keys are not left behind. Vimla is the domestic help for Shreya and her neighbour Padma; both live in a posh gated community. Vimla not only cleans the house, but also cooks for both the families. Shreya treasures Vimla ever since she joined her family four years ago. Vimla joined Padma‘s household this year. 1. In the last one year, Shreya had noticed cash missing on three occasions. 2. Shreya‘s husband also shared that a few notes were missing from his wallet, though he was not sure if they were stolen. 3. Her eldest son had been pestering Shreya for more pocket money for the last three weeks; in the last few days, he had stopped doing so. 4. In the last one year, Vimla had received six mails from her family asking for money. 5. Her eldest son‘s expenditure had gone up in the last few days. If the money was stolen, then someone who had the need for money should have stolen it. Out of the options available the choices 1&4 and 2&4 will increase the probability that Vimla has stolen it and hence, B and D are wrong. Options 3&5, 1&3, and 1&5 will increase the probability that Shreya‘s son has stolen it. Out of the three options 3&5 would make the probability of stealing by son the highest, which would imply that the probability that Vimla has stolen it is the lowest. Hence, E is the right answer. 1. She should let it pass, since to err is human. 2. She should confront Vimla and tell her that she knows the truth and the act is unpardonable regardless of her past service and she is thinking of terminating her services. 3. She should tell Vimla that she is aware someone has stolen money from the house but is not sure who it is. 4. She should share with Vimla that neighbours think Vimla has stolen the money though she doesn‘t, but is interested in finding out the truth. 5. She should directly ask Vimla if she stole the money, promising her no punishment if she confesses. Statement 1: (P-N, A-Y) Objective of prevention is not met in 1. Statement 4: (P-Y, A-Y (somewhat)): Message delivered to Vimla is same in 3 and 4, but 3 is more appropriate, as in 4 Shreya is bringing in a third party (neighbours) when it is she who suspects. Statement 5: (P-Y, A-Y). This is more appropriate than 4 but less appropriate than 3 since compared to 4 where Shreya is placing the blame on her neighbours, in 5 Shreya owns it up, however in 3 Shreya is discussing the incident, while in 5 she is pointing a finger at Vimla purely on suspicion. Therefore, Option D is the correct answer. Q. 3. Genius Consulting is a boutique consulting firm started by Shirish, Balram, Rahmanand Xavier, four friends from a premier business school. They committed themselves to abide by two principles: a) not to indulge in anything unethical and b) share earning sequally. Genius Consulting could not get a significant project till the following year, when they managed a big one after Rahman‘s father referred their firm to his top management. Convinced of the team‘s talent following an impressive presentation, the top management awarded them the project even though six other referred teams made presentations. The day following the presentation, they met to decide the way forward for the organization. Which of the following choices would be the most appropriate for Genius Consulting? A. As this project violates both their principles, Genius consulting should not take up the project. B. Due to the violation of the first principle Genius consulting should not take up this project. C. They should take up the project. Further, since Rahman had agreed to equal sharing, he is not entitled to finder‘s fee. D. They should take up the project and as the referral helped them survive, Rahman should be paid finder‘s fee. E. They should take up the project. But, in order not to violate the principles, Rahman can be paid finder‘s fee this year and an equal amount be deducted from his compensation the next year. Since company is formed with a motto of ethics and equal compensation, it should not be disturbed. Compensation, should not change based on who gets the business because tomorrow someone else might get the business or getting business may be a role assigned to one member, while others play equally important but different role. It is not an unethical situation because the project was won on the basis of capability and not because of favour from Rahman‘s father. Hence, C becomes the best option as no one is favoured. Mrs Biswas was to retire in one year after serving in the construction department of the Gujarat government for more than thirty years. After retirement, she wanted to spend her retired life along with Mr Biswas, a retired school teacher in a small town in Kerala. They had two children, both studying in Bengaluru. The Biswas‘ wished to construct a house in Kerala with their life savings. 1. Buy a fully furnished house from a big developer. 2. Buy a semi-furnished house from a big developer and furnish it. 3. Get a local unregistered contractor to construct a house and furnish it. 4. Mr Biswas with inputs from the family could supervise the construction of a house back in Kerala by employing the best material, engineers, masons and labourers. Q. 4. Which option would ENSURE the best control of quality of construction for the Biswas? A. The first option would ensure the best quality. B. The second option would ensure the best quality. C. The third option would ensure the best quality. D. The fourth option would ensure the best quality. E. Any of the options will equally ensure the best quality. In options A, B and C, the house owner lacks control over the quality of construction. However, in option D the owner can monitor discrepancies on an everyday basis and take corrective actions, if required, especially given Mrs. Biswas‘ professional experience. Option D is equivalent to continuous monitoring which is superior to one time monitoring in other options. Hence, D is the best answer. Q. 5. Which of the following additional information, IF TRUE, would improve the chances of the third option being preferred? A. Based on the current information, with no additional information, the third is the best option. B. Among local property holders, the contractor in the third option enjoys a good reputation. C. Big developers are less open to changes in design. D. Mr Biswas cannot stay back alone to supervise the construction. E. The Biswas‘ want to select the furniture on their own. Option C makes first and second options (in the caselet) less attractive, but does not make third option (in the caselet) as attractive as option B does. Option D makes first option (in the caselet) and second option (in the caselet) attractive but does not improve the chances of preferring the third option (in the caselet). Option E makes first option (in the caselet) less attractive and second option most attractive. Based on arguments presented in the previous question, it is clear that third option (in the caselet) was not the best. Hence, A is not the right answer. If the builder had good reputation among the local house owners, it means that the builder has been constructing houses to the satisfaction of the local house owners which probably would mean that the builder should be able to assure good quality. Hence, B is the answer. Q. 6. The Kerala Government recently announced a policy: In case of major quality infringement, the builder will pay a penalty of 50% of the price of the house in addition to the price of the house, to the client within a year of notice. Rank in ASCENDING order the options that would ensure ―control of quality. If builders are forced to pay penalty for bad quality then they are more likely to deliver good quality, though it would be difficult to force the penalty on unregistered builders. The chances of unregistered builder improving quality because of penalty are lower, as the builder can, more easily, escape the clutches of law. Hence, the right set of option should start with 3. It gives us C as the right answer. A pastor had eaten at a restaurant with his troupe of ten and his family. It is a norm to tip the waiter and about 20% of a waiter‘s salary comes from these tips. However, while paying the bill, the pastor crossed out the automatic 18% tip charged for parties of more than eight and wrote ―I give God 10% why do you get 18%?‖ above his signature. The chagrined waitress at the restaurant posted a photo of this on the social media. She was subsequently fired for violating company‘s policy on customer privacy. This would have been understandable if the restaurant had not posted just 2 weeks ago a customer receipt that was complimenting them. Social media and social activists came heavily upon the management‘s ambivalent stand and the firing of the waitress. In response, the company posted a note on their social media page defending their actions. This quickly drew over 10,000 comments, mostly negative, to which the management started responding by posting the same note over and over again. There were also accusations of the company deleting negative comments and blocking users. The restaurant also experienced a sizable drop in their footfall. Q. 7. Who/what is the main cause for the situation becoming unmanageable? A. The pastor for flouting the norm of restaurant. B. The waitress for violating customer privacy. C. The management for not taking action against the pastor. D. The management for giving out disproportionate punishment to waitress. E. The management for removing negative comments from the social media. Among the options available, the root cause would be that option which if removed will stop the further consequences. Applying this principle D is the root cause because had the management not meted out a disproportionate punishment, the current situation faced by the organization would not have risen. Even if the pastor flouted the norms, and the waitress violated the privacy, the public outcry would not have arisen unless the public perceived the punishment meted by the organization as unfair. It is not a crime to flout a norm; but, the waitress might have committed an offence by flouting the rules of the organization. However the punishment for such an alleged offence is what started the outcry. Hence, Option D is the right answer. Q. 8. The downward spiral continued for the restaurant as the management persisted in defending their actions and argued with those who criticised them. By the following week, the original post had generated over 18,000 negative comments. Which of the following is the best way forward for the restaurant at this juncture? A. Unconditionally restore the waitress to her former position and salary on the ground that she was never at fault in the first place. B. Apologise to and reinstate the waitress and ask her to apologize for her breach of customer privacy and post both the apologies on social media. C. Reinstate the waitress provided she apologises for her breach of customer privacy and post that apology on the restaurant‘s social media page. D. Reinstate the waitress if and only if she apologizes for her breach of customer privacy and posts that apology on her social media page. E. Recruit two waitresses at a higher wage but stick to the original decision of firing the waitress. for her action, in the social media. Hence, B is the best answer. A college campus with a population of around 2,000 of whom 200 were children, 1,200 people between 15 and 45 years, 500 people between 45 and 65 and around 100 people more than 65 years of age. The campus has two big gates opening out to the city. There are 400 cars and 500 motorbikes inside the campus. The residents relied on these vehicles to visit the city located 10 kilometres away. Now, with land within the campus becoming scarce, the chief administrator (CA) found the growing demand for parking lot difficult to handle. The faculty, staff and students wanted increased parking space. In the past six years, the parking requirement on campus had doubled. The CA found it inappropriate to construct parking lots from the students‘ fee, even though those with vehicles may not complain about it. Besides creating parking problems, the CA felt that these vehicles added to the pollution and made residents less responsible towards each other. The risk to the children and the elderly because of over-speeding was menacing. Therefore, the CA wanted to reduce the number of vehicles in the campus. Many faculty members, students and staff members, however, felt that demand for more parking space was natural as vehicles were required to go to the market, railway station, airport, and inter- state bus terminal all located in the city. They also told the CA that the elderly, sick and the toddlers relied only on these vehicles. After listening to all stakeholders, the CA wanted to solve these problems while ensuring the campus remained responsible and green. Q. 9. Which of the following actions would best satisfy all the stakeholders within the campus? A. Levy extra fee on students to construct additional parking lots inside the campus. Students should pay for up-keep of the campus. B. Let all vehicles be parked in a college-managed space outside the campus while two battery operated vehicles handle exigencies inside the campus. C. Bring all stakeholders to the discussion table. D. To reduce carbon footprints, only pooled vehicles should be allowed to operate inside the campus. E. Charge significant fee from any vehicle entering or leaving the campus. Option A is not possible because it is unfair to the students as mentioned in the case. Option C is not a solution as it talks only about discussions and not a decision. It can be a good initial point but not a concrete way to solve the problem. Option D is not the best solution as it does not address the concern of parking lot and emergencies. Further D is an inferior option in comparison to Option B even with respect to pollution control. Option E does not solve the problem as it does not address concerns of parking lot. Further, Option E is inferior in comparison to Option B with respect to pollution control. Option B is the best solution as it addresses parking as well as other issues including those related to environment. Q. 10. Which of the following would be the best option to increase revenue, decrease carbon footprint and still satisfy all the stakeholders in the campus? A. Make substantial collection from vehicles entering or leaving campus and construct a parking lot outside the campus. B. Levy extra fee on the students and build extra parking lots inside the campus. C. Bring all stakeholders to table and let them build consensus. D. To reduce the carbon footprint, only pooled vehicles be permitted on campus. E. Let all vehicles be parked in a managed space outside the campus while battery operated vehicles parked at the two gates can be used inside the campus. Option C is not correct as it offers a path but does not offer a solution. Option D is wrong because it does not provide the administration with any increase in revenue. Option E can reduce carbon footprints and satisfy stakeholders but there is no scope of increase in revenues. Option B is unfair as one stakeholder pays for deeds of others and it does not solve carbon footprints. Option A increases satisfaction for all stakeholders; it will also increase revenue and can reduce carbon footprints by making it costly to drive vehicles inside campus. So, Option A is the correct answer. Girirajan an unemployed youngster from Kumbakonam, Tamilnadu, visited Singapore where his school friend worked as software engineer. In Singapore, Girirajan realized that there were a lot of Tamils in ―Little India‖ area. He soon assessed that there were very few restaurants serving authentic Tamil food and decided to set-up a restaurant ―Giri‘s‖ in ―Little India‖ serving authentic Tamil food in traditional banana leaf. Customers loved the food. Very soon word spread about the good quality food served in the traditional way. Girirajan expanded operation recruiting 10 employees, all Tamils. Six months later, Girirajan realized that a lot of Kannadiga and Telugu customers started visiting the restaurant along with their Tamil friends. One day, a Kannadiga customer looking for Devangere Benne Dosa suggested that it may not be a bad idea for Girirajan to serve Karnataka and Andhra cuisines along with Tamil. With time, the popularity of the restaurant kept soaring. As a result, a lot of Malays, Indonesians and Chinese started visiting the restaurant. His software engineer friend advised to cater to customers of all nationalities. Despite his desire to go grand, Girirajan realized he did not have enough money to get extra space anywhere in Singapore and banks were also reluctant to lend. Q. 11. Which of the following options would be most suitable for the growth of the business? A. Include Karnataka and Andhra cuisines in the menu. B. Include Indonesian and Chinese cuisines in the menu. C. Keep the focus on Tamil food only with an increased focus on quality improvement. D. Expand to include either Karnataka and Andhra cuisines or Indonesian and Chinese cuisines. E. Include Karnataka and Andhra cuisines as well as Indonesian and Chinese. The business has already reached 90% utilization (and this is improving further) during peak hours, in addition he has space constraints. Making substantial changes will incur lot of costs but opportunities for benefits are limited because of existing 90% utilization. Further, selling dishes of other regions might affect current focus on authentic Tamil food (and this was the business opportunity according to the passage). – . Moreover, there is no surety that he will do well in other cuisines because lack of experience/expertise. Hence, Giri is better off to focus on authentic and quality Tamil cuisine which is the reason for his success. So, option C is the correct answer. Q. 12. Girirajan started analysing his quarterly customer data to assess growth opportunities. He discovered that 20 % of his customers are Kannadigas and many of them were requesting for a few Karnataka dishes. He was not sure if it was a good idea to serve Karnataka food. He wanted to experiment before taking the final call. Which of the following options will be worth experimenting in the next fortnight? A. Introduce a Karnataka food day every week to please the Kannadiga customers. B. Recruit a few Kannadiga waiters to interact with Kannadiga customers. C. Rename a few Tamil dishes as Karnataka dishes. D. Serve Karnataka dishes as and when requested by customers without the menu displaying these dishes. E. Add a few Karnataka dishes to the cuisine and display these in a separate menu. The objective is to experiment with a few Karnataka dishes. Customer should be aware of it, but this (experimentation) should not be added to the mainstream business as of now, therefore, should not be part of the main menu. The only option that satisfies both the criteria is E and therefore, Option E is the right answer. A. 14, 15, 16, 17, 18, 19, 20, with total sales trend increasing by 0.4%. B. 20, 20, 20, 20, 20, 20, 20, with total sales trend increasing by 0.4%. C. 50, 47, 44, 40, 47, 45, 40, with total sales trend remaining same. D. 45, 44, 43, 42, 41, 40, 39, with total sales trend remaining same. E. 20, 50, 10, 45, 43, 13, 36, with total sales trend coming down. In Option A, the trend for sales for Karnataka dishes increasing along with the total sales increasing and hence A is the right answer. A University coach was asked to select teams in three sports: Shooting, Cricket (batsmen only) and ―Snakes & Ladder. The honest and keen observer head boy of the school informed the coach that he had observed 100 students playing the three games – shooting, cricket and ―Snakes & Ladder‖. In shooting, all students were given 100 chances to hit a target. In cricket, a batsman faced a maximum of 100 balls, provided he DID NOT GET OUT. In ―Snakes & Ladder, every student could play 100 matches, one each with the other students and one against a computer. In shooting, a player got one point for hitting the target and zero point for missing the target. In cricket, a batsman got one point for hitting the ball and zero point for missing it. In ―Snakes & Ladder‖, a person got one point for winning the game and zero for losing. To the coach‘s utter surprise, the distribution of points across all three games was the same. The coach has to select a team of eleven in each sport. Q. 14. Which of the following options is the best way to select the ―Snakes & Ladder‖ team? A. The coach must select all students between 80 and 99. B. The coach must select both the students between 90 and 99. C. The coach must select at least 6 students between 40 and 59. D. The coach must not select students between 0 and 9. E. The coach can ignore the data in the table and randomly pick any 11 players. In Snakes and Ladder, the player cannot exhibit any skill and therefore cannot determine the outcome, which is random if the dice is fair. The past data in the table is not relevant for selection. 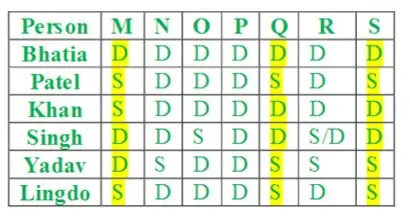 Hence, the best selection process should give equal opportunity to everyone and therefore, Option E is the right answer. Q. 15. Which of the following options is the best way of selecting the Shooting team? A. The coach should select all students in 80-99 ranges. C. The coach should select at least 6 students between 40 and 49. D. The coach should not select students between 40 and 89. E. The coach can pick randomly any 11 players from any of the ranges. In hundred shooting trials, it is highly unlikely that any student would get a high score unless he/she is really good at shooting. The trials give us enough information to choose those who have scored the highest. Therefore, option A is correct. Q. 16. Which of the following options is the correct statement for picking up the cricket team? A. The coach should never select the player in the range of 0-9 points. B. The coach should never select players from the range of 50-59. C. The coach should never select players from the range of 70-79. D. The coach should definitely select players only from the range of 80-99. In the game of cricket, a player has to stop batting when he gets out. Therefore, there is no guarantee that even the best of batsman will play out all 100 balls. On the contrary, even the worst batsman can play hundred balls, though chances are low. Hence, there is a possibility that best batsman can get out after playing 5 balls and worst batsman can play more balls than him. Hence, the coach can never be sure of rejecting a person with low score or select a batsman, based on the above data. Hence, options A, B, C, and D all are wrong. Best answer is Option E.
Q. 17. As a newly started organization in the IT sector, Saksha IT is a fast growing 400 employee organization. Its head, Saksha Kumar believes in building an organization driven by humility. Which of the following policies would best help him achieve that? A. Employees shall, in their annual evaluation form, be asked to acknowledge three of their shortcomings, overcoming which will make them better. B. Employees shall be asked to share with their peers three shortcomings they had noticed about their peers. C. The immediate superiors would suggest three shortcomings their subordinates have to work on in a given period. D. Everyone beginning with Saksha, shall be asked to share three of their weaknesses, in a public forum. E. Employees shall be asked to overcome three shortcomings in the following year. Improvement, if noticed would attract rewards. Humility is the quality of not being proud of being perfect as you are aware of your limitations. Therefore, among the options, the option that focuses on awareness of the self with respect to limitations should be in the consideration set for the correct answer. However, the focus on awareness of self is not necessarily linked to ―improvement‖ or ―overcoming‖ the limitations. Moreover, the culture of humility should not be confused with the performance measurement or rewards and compensation. 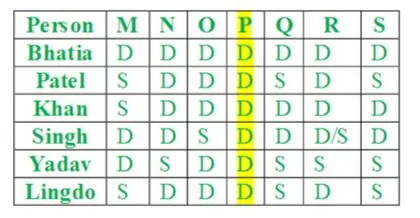 Among the options, Option D focuses on making one aware of one self without any link with rewards or performance and hence, Option D is the right answer. Q. 18. Principal Maheshwari of BINK School of Management is facing a problem that calls for quick action. She received an anonymous mail one day, possibly from one of the students, complaining about outdated syllabus, mediocre teachers and poor choice of courses on offer. A. She should invite students to discuss any problem openly, one on one or in small groups, promise to act on them but firmly condemn the culture of anonymous mails. B. She should update the students about the efforts the institute is taking in sprucing up the syllabi, hiring talented faculty etc., but make no reference to the letter. C. She should convene a meeting of the faculty at the earliest and get them to work on updating the syllabi and also arrange a faculty development program but keep mum about the letter. D. She should convene a meeting of the faculty and talk about the letter as a symptom of a deeper malaise, ask them to update the syllabi and also organise a faculty development program. E. She should ignore the letter and not think about it at all. The principal has received an anonymous mail which could be a result of an underlying concern, which might be genuine or not, among the student(s). So, she should focus on the underlying concern, but this way of communicating anonymously is something that should be strongly discouraged. Since the underlying concern may or may not be genuine, she should openly invite students for discussions but not discuss the mail as such. Hence, Option A is the right answer because principal is addressing: a) the issue of anonymous email and b) whether the content of the email is a concern. Shyam prepares and sells piping hot puri and sabji (gravy) from 7:00 am to 9:00 am (both inclusive) through a stall at XLRI campus. Presently, he has just a single oven, which can do only one job at a time. It takes 30 minutes to cook one handi (a large bowl) of sabji, sufficient for 12 customers. It takes him 10 minutes to prepare 2 plates of puri at a time. While the cost of a plate of puri-sabji is ₹10, the price is ₹25. Puri stays hot for only 5 minutes after preparation, while sabji stays hot for 30 minutes only. It takes 10 minutes to reheat the sabji which stays hot for another 30 minutes. If he brings a handi of hot sabji from home, the transport would cost him ₹5 0. It can also stay hot for 30 minutes excluding the transportation time. Currently, every 20 minutes five plates are ordered. All unsold quantities are distributed at cost after 9:30 am. Q. 19. Find the maximum number of plates of puri-sabji Shyam can sell in the first hour of business? Q. 20. Shyam‘s puri-sabji became famous. Now he gets 5 orders per 10 minutes and has invested in an additional oven. As he is working alone on both the ovens simultaneously, now in any one oven it takes him 45 minutes to cook one handi of sabji, 15 minutes for 2 plates of puri and 15 minutes to reheat the sabji. He can bring only one handi from home. What will be his maximum daily profit? The answer is B (280), can be seen. Q. 21. Shyam‘s stall was becoming popular by the day. Now he gets 5 customers every 10 minutes. After buying a second oven, he employed a helping hand, Aman at ₹100 for two hours. Aman can cook one handi of sabji in 20 minutes or can prepare 3 plates of puri in 10 minutes. Reheat time for sabji is 10 minutes. None of them can work on both the ovens simultaneously. Which of the following options will help Shyam maximize his daily profit, if he does NOT bring sabji from home? A. Shyam should dismiss Aman because his wages are more than the benefits he brings. B. Shyam will prepare only puri and Aman will prepare only sabji. C. Shyam will prepare only sabji and Aman will prepare only puri. D. Shyam and Aman will prepare both puri and sabji. E. Options B, C and D will yield the same profit. (100), option D remains the better. Indian Institute of Research is a Government-established body to promote research. In addition to helping in policy making, it also provides free online access to all the articles to the public. It has a mission of publishing high quality research articles. Till 2010, the publication of articles was very slow because there was no incentive for researchers to publish. Researchers stuck to the mandatory one article a year. Most of the researchers engaged in offering consultancy and earned extra income. Since its inception, the institute was considered the best place for cutting-edge research. The new director of the institute was not happy with the work done by researchers in silo and came out with a new research policy in 2013 to increase research output and improve collaboration among researchers. It was decided that extra benefits would be offered to researchers with new publications. As a result, the number of research articles increased fourfold in 2014. At the 2015 annual audit, an objection was raised against the new benefits scheme. Auditors were not happy with increased expenses towards remuneration for researchers. Further, the Government opined that the publication was itself a reward and hence researchers need be paid nothing extra. The director tried to defend his policy but the response from the government was not encouraging. Q. 1. The following facts were observed by an analytics team hired by the government to study the extant situation. (the quality of articles published has decreased). Q. 4. The following day Kamal, being the most competent hairdresser on the street, was contemplating charging higher than agreed upon price. Exp: He wants to charge more for his competence but with minimum violation of the agreement. So for the agreed services he cannot charge more. But for any new service he can charge more. Hence A is the correct answer. Q. 5. Vimal relies heavily on a bunch of loyal customers. He is concerned about retaining them. Q. 6. The Mayor wants the owners and drivers to care about comfort. Q. 7. The mayor wants to involve the car owners in finding a solution to the problem of comfort and safety. He is concerned that the customers may not be willing to pay more for safety. Q. 8. After the elections, Ghosh requested Chatterjee to sanction the land adjoining his factory, for expansion. However, the requested government land was a green belt reducing harmful pollution from the factory. Q. 9. Inspired by Bhowmick’s manifesto, Chatterjee is contemplating a green policy which can adversely affect Ghosh’s business interests. Q. 11. Recruiting Nicky, Manoj and Benita was part of a larger initiative to make the organization attractive to prospective employees. Recently Amelia’s boss informally told her that the trio’s perception of the organization might influence future recruitment from top B-schools. However, the trio had already expressed their unhappiness about the organization to Amelia. She suspected that her promotion due next year might depend on the trio! Q. 15. An independent and trustworthy confidante of Rajan Shekhawat, the CEO of the company, informed him that one of their main competitors had bribed the food testing agency to manipulate the report. Q. 16. Purushottam sends a batch of sweets to the Police station across the street every day. Ratan construed it as a bribe and wanted to stop this practice. Q. 17. Purushottam’s eldest son discovered that the shop repackaged sweets that were close to expiry and sold them at a discount under different names. These sweets usually get sold very fast. But his son was concerned about the possible consequences of this practice. Purushottam was thinking of the following arguments to convince his son. Q. 18. Purushottam’s younger son Pramod discovered that 10% of their customers whom Purushottam called privileged customers purchased sweets at prices fixed 10 years ago (which is significantly lower than the current prices). Purushottam told him, “This 10% are my core and loyal customers with whom I have personal connect and therefore they deserve this privilege”. Pramod refuted his father’s argument citing the following information. A person is ‘satisfied’ if a project meets all three preferences. Q. 19. Identify the project(s) where NONE of the 6 persons will be ‘satisfied’. E. In all projects at least one person will be ‘satisfied’. Hence the right option is C.
Q. 20. Identify the project(s), where AT LEAST 3 of the 6 persons will be ‘satisfied’. Hence the right option is D.
Q. 21. The marketing managers of all the six projects have agreed to add a recreation club and a car parking facility to the projects. In this changed scenario identify projects where AT MOST 2 of the 6 persons will NOT be ‘satisfied’. Hence the right option is A. For Geetha soil preparation does not incur any cost. If a crop is abandoned before the scheduled harvesting, she gets no money. Geetha is preparing a cropping schedule to maximize her annual profits (i.e. price – cost). She plans to replicate the schedule in the coming years. Q. 22. Which of the following would DEFINITELY be a part of the ideal schedule? A. Cultivate crop B in August or September. B. Cultivate crop B from April to September. C. Do not cultivate any crop in August but cultivate crop D in September. D. Cultivate crop D or crop E in August or September. E. Do not cultivate any crop in August; but cultivate crop D or crop E in September. Though crop E generates the same profit, we cannot produce E from Sep to Dec because in that case, crop A cannot be cultivated from Jan. Hence, the correct answer is Option C.
Q. 23. Which of the following schedules would maximize her annual profit while minimizing the costs, if Geetha decides NOT to repeat a crop in a calendar year? Directions for questions 1 to 3: Answer questions on the basis of information given in the following case. Q. 1. On her way back Simran met her friend Raj and shared the above information. Raj is preparing for XAT and is only interested in Grade-oriented (G) electives. He wanted to know the number of G-type electives being offered. Simran replied, “You have all the information. Calculate the number of G-type electives yourself. It would help your XAT preparation”. Raj calculates correctly and says that there can be _______ possible answers. Q. 2. Simran prefers J-type electives and wants to avoid Q-type electives. She noted that the number of only J-type electives is 3. Raj’s preference is G-type electives followed by Q-type electives. However, they want to take as many common electives as possible. What is the maximum number of electives that can be common between them, without compromising their preferences? e) Not possible to answer from the above information. Q. 3. Vijay and Raj want to avoid each other. Vijay is interested in J-type electives and wants to avoid Q-type electives. Raj’s preference is Q-type electives followed by Q-type electives. Raj noted that the number of only G-type electives is 2. Is there a possibility that they would not share any common electives(s)? b) No. They would meet in one elective. c) No. They would not be able to avoid in two electives. d) No. They meet in five electives. e) Cannot be solved with the information given. Directions for questions 4 to 6: Answer questions on the basis of information given in the following case. apprehensive that your failure to act may warrant further action leading to dismissal. I will continue to monitor and assess your performance over the next three months to determine whether improvements meet the expectations. At the same time, I would like to re-affirm that you are very valuable for our organization. Q. 4. Initially, the e-mail distracted Dipangshu but he decided to focus on the job. Which of the following options might best explain his decision to do so? a) Mr. Patel would soon be transferred to another department. b) Last week, Mr. Dipangshu has been assigned to a new team in the same project. c) Three days back, Mr. Dipangshu has been assigned a new project similar to his final year engineering project. d) His friend has been hospitalized for the last three months. e) Failing to perform in the client meeting might further complicate things. Q. 5. The scheduled presentation went off smoothly. Back in his cabin, Dipangshu read Mr. Patel’s e-mail once more and pondered over it. During the last meeting he tried hard to put forward his explanation but Mr. Patel had not allowed him to speak. Dipangshu was thinking of meeting Mr. Patel once again but was doubtful that would help. Incidentally, he had a job offer from a start-up with a comparable salary. If Dipangshu was to join the new job, he had to accept the offer within the next two weeks. However, he cannot think of a life without a job. Dipangshu was confused! a) Talk to Mr. Patel and highlight the initiatives he has taken but at the same time start applying for other jobs. b) Reject the offer from the start-up. Use the next three months to find a better job, but continue in the present job. c) Resign from this organization right now. d) Accept the offer, only if the start-up gives a salary hike, else keep prospecting. e) Accept the offer with a request to give him a 10% salary hike. Q. 6. After a couple of weeks, Mr. Patel came to know that Dipangshu’s project leader Mr. John, a very competent senior executive, may have wilfully influenced his team members to file a wrong complaint against Dipangshu. Mr. John may have done it because Dipangshu has refused to tow John’s line. Mr. Patel also came to know that Dipangshu was thinking of quitting this job. He felt regretful about his letter to Dipangshu. He wanted to resolve the complicated situation. He was contemplating following five actions in his mind. Directions for questions 7 to 9: Answer questions on the basis of information given in the following case. A few years back Mr. Arbit and Mr. Boring started an oil refinery business. Their annual earing is currently just 50,000 million rupees. They are now exploring various options to improve the business. Mr. Xanadu, a salesperson from Innovative Technology Solutions (ITS), is trying to sell a new oil refinery technology to Mr. Arbit and Mr. Boring. This technology could potentially enhance their annual earning to 150,000 million rupees within a year. But they have to make one-time investment of 100,000 million rupees to implement the technology. If the technology is not successful, the investment would be lost. Mr. Arbit and Mr. Boring are discussing about possible risks of the investment. Q. 7. Mr. Arbit is enthusiastic about this investment idea but Mr. Boring is a little sceptical. This impasse makes them approach a consultant. The consultant makes some observations.Which of the following observations, made by the consultant, might reduce Mr. Arbit’s enthusiasm for the new investment idea? a) Investment is warranted only when benefits outweigh costs. b) Technology investments give higher earnings in future. c) Investment in technology leads to reduction of costs in the long run. d) Technology risks can be controlled. e) Business is all about taking risky decisions. Q. 8. In order to sell the technology to Mr. Arbit and Mr. Boring, Mr. Xanadu is thinking of five possible sales pitches. Which of the following sales pitches would reduce uncertainties the most for Mr. Arbit and Mr. Boring? a) All other competitors are aggressively investing in risky technologies. b) If the technology succeeds, the annual earnings would grow 3 times from the next financial year and they would be able to recover the invested money within 1 year. c) Preliminary studies indicate that success rate of the technology is 85%. d) The R&D team of ITS is working to counter any possible downside of the technology. Q. 9. Mr. Arbit and Mr. Boring did not invest in the new technology, but the new technology is a big success. Repentant, they are now estimating the additional amount they would have earned (i.e. forgone earnings) had they invested in the new technology. However, the two owners differed on expected lifespan of the new technology. Mr. Arbit expected lifespan to be 5 years, whereas, Mr. Boring expected it to be 2 years. After the technology gets out- dated, the earnings from the business would drop back to 50,000 million rupees. Directions for questions 10 to 13: Answer questions on the basis of information given in the following case. a) If sales volume of patented drugs in India is 43%, the sales volume of generic drugs in India will be less than 43%. b) If the sales volume of generic drugs in foreign countries is at least 24%, the sales volume of patented drugs in India will be above 24%. c) If the sales volume of patented drugs in India is 54%, the sales volume of generic drugs in foreign countries will be above 54%. e) If the sales volume of generic drugs in India is at least 60%, the sales volume of patented drugs in foreign countries will be above 60%. Q. 11. Mr. Sinha, a senior executive of LSP, observes that their business in India is not vibrant. LSP faces stiff competition from Indian and global players, except in rural areas. Interestingly, most of their sales in the rural area are from cough syrup, used as sedatives by teenagers. Mr. Sinha is planning the following actions to improve business in the long run. Q. 12. Mr. Rastogi, HR head of LSP, is contemplating of transferring MR. Jose, from India to their Luxembourg office. Mr. Jose’s wife is also with the HR department of LSP. The couple is expecting their first child within next four months and hence they want to be together. Mr. Rastogi is wondering whether Mr.Jose would accept the transfer. If he doesn’t, Mr. Rastogi would have to send a less competent person for this job as early as possible. The office in Luxembourg is very important for the company’s future. It is at its nascent stage and does not yet have an HR department. Hence, it is not possible to transfer Mrs. Jose to Luxembourg. a) Giving a salary hike to Mr. Jose with a promise to transfer Mrs.Jose to Luxembourg in the near future. b) Giving Mrs. Jose option to work from home while in Luxembourg so that she can be with Mr.Jose. c) Giving Mr. Jose option to work from India for the time being so that he can be with Mrs. Jose in India. d) Giving a salary hike to Mr. Jose to compensate for Mrs. Jose’s salary so that she can join Mr. Jose at Luxembourg, even with loss of pay. e) Asking Mr. Jose to accept the offer right now but give him up to six months to join Luxembourg office. Directions for questions 14 to 16 : Answer questions on the basis of information given in the following case. Mohan’s was a popular fast-food joint at Connaught Place, Delhi. Initially Mohan handled his business alone. His sons, Ram and Kishan, joined the business after graduation from college. Ram was entrepreneurial in nature. Subsequently, another branch of Mohan’s was opened in Panipat. Mohan had chosen Ram to head the Panipat branch. Though Ram increased sales in short time, he had stopped using premium quality organic vegetables, the speciality of Mohan’s. Mohan and Kishan were not happy with his way of doing business. a) Training Kishan to replace Ram in a few months. b) Not worrying about ingredients as long as business grows. c) Bringing Ram to Connaught place branch. d) Naming the Panipat branch as ‘Ram’s’, and changing it back to Mohan’, when needed. e) Asking Kishan to run the Panipat branch. Q. 16. After discussing with a few customers, Mohan realised that compromising on the quality of ingredients at Panipat branch may not be good idea but at the same time he also realized that Panipat branch had grown fast. He was contemplating following five actions. Which of the following actions would be the best for the future of his business? a) Creating awareness campaign for organic vegetables in Panipat. b) Mohan himself should took after the Panipat branch. c) Close down the Panipat branch. d) Send Kishan to Panipat branch and bring Ram to Connaught place permanently. e) Hire a new person to run the Panipat branch. Directions for questions 17 and 18: Answer questions on the basis of information given in the following case. students, in general, shy away from application-based problem and even those with entrepreneurial mind-set target formula-based problems. I. Preparing a question paper of two parts, Parts A and Part B of duration of one hour each. Part A and Part B would consist of formula-based problems and application-based problems, respectively. After taking away Part A, Part B would be distributed. The qualifying cut-off percentile would be calculated on the combined scores of two parts. Directions for questions 19 to 22 : Answer questions on the basis of information given in the following case. has significant followers within the party and is considered an asset to the party. Any harsh decision against Mr. Loyal would adversely affect the future of NPP and could even lead to a split in the party. This would benefit the opposition. Q. 19. Which of the following actions would adversely affect both NPP and Mr. Loyal, the most? a) Take no action against Mr. Loyal. b) Suspend Mr. Prodigal from the party with immediate effect. c) Expel Mr. Loyal from the party with immediate effect. d) Ban Mr. Loyal from entering party premises till completion of court proceedings. e) Initiate an internal inquiry to find the truth. Q. 20. At the Disciplinary Committee meeting, members came up with the following suggestions. Which of the following suggestions would harm the party, the least? c) Initiate an internal inquiry to find the truth. d) Suspend Mr. Prodigal from the party with immediate effect but announce that he will be taken back if the court declares him innocent. e) Suspend both Mr. Loyal and Mr. Prodigal from the party with immediate effect. Q. 21. Mr. Opportunist, a veteran member of NPP, stakes his claims to be nominated as an NPP candidate in the upcoming election. Mr. Opportunist presented the following arguments in favour of his candidature to the NPP Executive Committee. Q. 22. The Disciplinary Committee has decided to suspend Mr. Loyal from the party because they felt he was influencing the judicial process. However, Mr. Loyal feels that the committee is biased and he is being framed. Now, election has been announced. The last time. Mr. Loyal had won with a majority on account of his good work. Which of the following options is most likely to resurrect Mr. Loyal’s immediate political career? a) The main opposition party has invited Mr. Loyal to join the party and contest the election Chance of winning is high. b) Not participation in the campaign and instructing his followers to stay away from the campaigning process. c) Ask his followers to support the NPP nominated candidate and display his loyalty to NPP. d) Mr. Loyal should contest as an independent candidate. But because of a split in votes, his chances of winning would be low. e) Influence the nomination process through his followers within NPP, to get one of his close associates nominated. Directions for question 23: Answer question 23 on the basis of information given in the following case. E. Communicative relativism, which states that anthropologists should not be selective in communicating their findings. Q. 2. Consider merit pay for teachers, Schools face constant pressure to change their management approaches to improve performance, which is usually assessed by standardized reading, math, and science scores. In most schools teachers’ pay is determined by seniority, years of total teaching experience, and credentials. Pay is rarely based on performance, which is contrary to the belief among parents and private sector. Parents and business leaders lament that there are no carrots/sticks used to motivate teachers. Consequently, there has been greater push to implement some form of merit pay to improve the motivation. Which of the following statements will disprove the claim of the parents and business leaders? A. A recent study suggested that teachers are self- motivated. B. Teachers are largely motivated, by financial incentives; so pay for performance will induce greater and more effective effort. C. Learning cannot be measured reliably and accurately by a test given once a year. D. Teaching is a solo-activity; there is a little interdependence with other co-curricular and extra-curricular activities in the school. E. To err is human, and hence stick should be used to reduce errors. Q. 3. In a new study by Harvard School of Public Health (HSPH), researchers explored how caffeine can serve as a “mild anti-depressant”. They concluded that “drinking several cups of coffee daily appears to reduce the risk of suicide”. Data pulled in from three large studies in the US showed that the suicide risk of those who drank two to four cups of caffeinated coffee a day was about half of those who drank decaffeinated coffee or very little Of no coffee. In the studies, a respondent’s caffeine consumption was assessed every four years through a questionnaire. The respondents were all adults, and the study was published online. The authors, however, cautioned the public from increasing coffee intake as it could result in “unpleasant side effects”. “Overall, our results suggest that there is little further benefit for consumption above two to three cups/day or400 mg of caffeine/day,” wrote the researchers. The authors observed that there was no major difference in suicide risk for adults who drank two to three cups a day from those who drank four cups or more. Which of the following shaped graph would best capture the above paragraph (x-axis represents “coffee intake” and Y-axis represents “suicidal tendency”)? • Faneesh finishes before Ashok. • Divya finishes before Benj amin and Eshant. • Irravaty finishes after Chetan. • Girish finishes after Ashok. Which is the best position Girish can finish? Answers Questions 5 to 7 based on the information given below. Ms. Banerjee, class teacher for 12 standard, wants to send teams (based on past performance) of three students each to district, state, national and international competition in mathematics. Till now, every student of the class has appeared in 100 school level tests. The students had following distribution of marks in the tests, in terms of “average” and “number of times a student scored cent percent marks”. Ms. Banerjee has carefully studied chances of her school winning each of the competitions. Based on in- depth calculations, she realized that her school is quite likely to win district level competition but has low chances of winning the international competition. She listed down the following probabilities of wins for different competitions. Prize was highest for international competition and lowest for district level competition (in that order). All the students are studying in the school for last twelve years. She wanted to select the best team for all four competitions (Ms. Banerjee had no other information to select students). Q. 5. Which of three members should form the team for the International competition? Q. 6. Which of the following members should constitute the team for the district level competition? Q. 7. Ms. Banerj ee has to select the team for national competition after she has selected the team for international competition. A student selected for international competition cannot be a part of national competition. Which is the best team for the national competition? Answers Questions 8 to 11 based on the information given below. Krishna Reddy was the head of a pharmaceutical company that was trying to develop a new product. Reddy, along with his friend Prabhakar Rao, assessed that such products had mixed success. Reddy and Rao realized that if a new product (a drug) was a success, it may result in sales of 100 crores but if it is unsuccessful, the sales may be only 20 crores. They further assessed that a new drug was likely to be successful 50% of times. Cost of launching the new drug was likely to be 50 crores. Q. 8. How much profit can the company expect to earn if it launches the new drug (suppose there are no additional costs)? Now, Reddy and Rao were in a quandary whether the company should go ahead and market the drug. They contacted Raj Adduri, a common friend for advice. Adduri was of the opinion that given the risky nature of launch, it may -be a better idea to test the market. Rao and Reddy realized test marketing would cost 10 crores. Adduri told them the previous test marketing results have been favorable 70% of times and success rate of products favorably tested was 80%. Further, when test marketing results were unfavorable; the products have been successful 30% of the times. Q. 9. How much profit can the company expect to make if the product is launched after favorable test marketing results (assume there are no additional costs)? Q. 10. What is the probability of product failure if Reddy and Rao decides to test market it? Q. 11. If Rao and Reddy decides to launch the product despite unfavorable test marketing, how much profit can the company expect to earn? Please read the three reports (newspaper articles) on ranking of different players and products in smart phones industry and answer the question nos. (12-15) that follow. Apple nabs crown as current top US mobile phone vendor. Apple’s reign may not be long, as Samsung is poised to overtake, Apple in April, 2013. For the first time since Apple entered the mobile phone market in 2007, it has been ranked the top mobile phone vendor in the US. For the latter quarter of 2012, sales of its iPhone accounted for 34 percent of all mobile phone sales in the US – including feature phones—according to the latest data from Strategy Analytics. While the iPhone has consistently been ranked the top smartphon e sold in the US, market research firm NPD noted that feature phone sales have fallen off a cliff recently, to the point where 8 out of every 10 mobile phones sold in the US are now smartphones. That ratio is up considerably from the end of 2011, when smartphones had j ust cracked the 50 percent mark. Given this fact, it’s no surprise that Apple, which only sells smartphones, has been able to reach the top of the overall mobile phone market domestically. For the fourth quarter of 2012, Apple ranked number one with 34 percent of the US mobile market, up from 25.6 percent year over year. Samsung grew similarly, up to 32.3 percent from 26.9 percent—but not enough to keep from slipping to second place. LG dropped to 9 percent from 13.7 percent, holding its third place spot. And while Apple is the top vendor overall among smartphones, its iOS platform is still second to the Android platform overall. Samsung is the largest vendor selling Android-based smartphones, but Motorola, HTC, LG, and others also sell Android devices, giving the platform a clear advantage over iOS both domestically and globally. I don’t actually believe the numbers for Samsung. Ever since the debacle in early 2011, when Lenovo called into question the numbers Samsung was touting for tablet shipments, stating that Samsung had only sold 20,000 of the 1.5 million tablets they shipped into the US the last quarter of 2010, Samsung (who had no response to Lenovo) has refused to supply quarterly sales numbers for smartphones or tablets. That’s an indication that their sales aren’t what analysts are saying. Then we have the usage numbers. Samsung tablets have only a 1.5% usage rate, where the iPad has over 90%. Not as much a difference with the phones but it’s still overwhelmingly in favor of the iPhone. The problem is that with Apple’s sales, we have actual numbers to go by. The companies who estimate can calibrate what they do after those numbers come out. But with Samsung and many others, they can’t ever calibrate their methods, as there are no confirming numbers released from the firms. A few quarters ago, as a result, we saw iSupply estimate Samsung’s smartphone sales for the quarter at 32 million, with estimates from others all over the place up to 50 million. Each time some other company reported a higher number for that same quarter, the press dutifully used that higher number as THE ONE. But none of them was the one. Without accurate self-reporting of actual sales to the end users, none of these market share charts are worth a damn! iPhone5 Ranks Fifth In U.S. Customer Satisfaction Survey inShare The iPhone5 ranks fifth in customer satisfaction according to the results of a recent survey from OnDevice Research, a mobile device research group. In the poll, they asked 320,000 smartphone and tablet users from six different countries, how, satisfied they were with their devices,. According to 93,825 people from the US, Motorola Atrix HD is the most satisfying and Motorola’s Droid Razr took second spot. HTC Corp? (TPK:2498)’s Rezound 4G and Samsung Galaxy Note 2 took third and fourth spots, while Apple’s iPhone5 landed in fifth spot. Despite the lower rankings, things aren’t looking too bad for Apple Inc. (NASDAQ:AAPL) elsewhere. In the United Kingdom, they ranked second place, right after HTC One X. Interesting enough, Apple did take top spot for overall satisfaction of mobile device, whereas Google Inc. (NASDAQ:GOOG) ranked second. Motorola Mobility Holdings Inc. (NYSE:MMI), HTC Corp (TPE:2498), and Nokia Corporation (NYSE:NOK) took third, fourth, and fifth places respectively, while Sony Ericsson trailed behind at sixth place. France, Germany, Japan, and Indonesia. Although OnDevice didn’t share the full list of devices mentioned in the survey* it does show some insight to what customers want. Unfortunately, there were still many questions regarding the survey that were left unanswered. F.veryone wants to know why Google Inc. (NASDAQ:GOOG) was on the list when they are not an actual smartphone maker and why was Samsung Electronics Co., Ltd. (LON:BC94) on the bottom of the satisfaction list when the brand is leading elsewhere. Fortunately, those questions were answered by On Device Research’s representative. He explained that the survey was conducted on mobile web where the survey software could detect the taker’s device and since users rate their satisfaction levels on a 1 to 10 scale, thanks to the Nexus device, Google was included. Q. 12. If you analyze the three reports above, which of the following statements would be the best inference? A. Newspapers publish completely wrong data. B. All three reports have been bought by the companies. C. Newspapers may report selectively. D. Apple is leading but its dominance in Korean market is definitely under threat. E. Customer’s response, in report 2, is neutral and objective. Q. 13. Assume report 1 and report 2 are both correct, which of the following can be a reason for seemingly divergent ranks of different companies and their products? A. iPhone4, another product from Apple, could have been the best seller in the U.S.
B. HTC-One was the most preferred device in Japan. C. OnDevice included Google in the list because it is an important player in Android market. D. Customer satisfaction never leads to higher customer loyalty. Q. 14. If report 1 and report3 are both correct, which of the following can be a reason for seemingly divergent ranks reported for different companies and their products? Q. 15. Which of the following is more likely to be a correct conclusion about the respondent/reader in report2? A. The reader is an Apple user. B. If the reader is an Apple user, his usage rate is higher. C. The reader is a frequent user of HTC One. D. The reader does not like Android platform. E. The reader wants more objective data to be released by the companies. Answers Questions 16 to 18 based on the information given below. Ajay was thinking deeply about a problem that his organization, a business consulting company, faced. Globalization had affected his company like many other companies. Despite the downturn, the current revenues remained healthy. However, Ajay knew it was inevitable that the company could not do business the same way. The complexity of managing the business had increased with time. Consultants were under pressure to deliver good and innovative solutions. The organization had consultants from different age groups having a good mix of domain and industry expertise. It was a flat organization with three levels. The biggest challenge for Ajay was to have consultants with latest knowledge who would also earn revenues. Getting additional business was a challenge as all the consultants were busy and it was very difficult to hire new consultants. Q. 16. Some of the consultants were adept at applying old solutions to new problems. Ajay was not very sure if this would work for long. Some of the clients had complained about the performance of old and reputed consultants. Ajay was mulling over the following five solutions to tackle this problem. 1. Decrease time spent on client interaction and increase time spent for generating solutions. 2. Increase support staff to help consultants to remain updated. 3. Decrease the number of simultaneous projects handled by consultants. 4. Make it compulsory for consultants to work on inter-industry and inter-domain problems. Which of the following would be the best sequence of decisions taken by Ajay (starting from immediate to distant)? Q. 17. After Ajay implemented some of the steps mentioned above, consultants wanted to renegotiate their contract with the organization. It seems that the organization had never mentioned that consultants have to work across industries and domains. Some of the old consultants were reluctant to change their ways, while many of the younger consultants were willing to follow Ajay’s advice. Which of the following decision can be taken by Ajay to handle this situation? A. Retrench old consultants and recruit young consultants. B. Pressurize non-conformists by giving preferential treatment to the conformists. C. Negotiate with the old consultants and communicate that the new rules would apply to the new consultants only. D. Do nothing and wait for a right solution to emerge, as with time resistance would die down. E. Discuss the issue in an open house and let solutions emerge democratically. 2. Set a future direction for the organization in these challenging times. 3. Benchmark performance with respect to the best consulting company in industry. 4. Empower senior consultants and at the same time seek opinion of all others for handling future challenges. Answers Questions 19 to 21 based on the information given below. Intercontinental Business Manufacturing (IBM) was doing a roaring business. Demand of the products was high and supply of raw-material was abundant. IBM was manufacturing three different products. Some customers bought two types of products and some bought only one. The three products were “quickie – quick”, “run-of-the-mill”, and “maxi-max”. Customers were not complaining loudly. Ram, the product manager, was confused! Demand for “quickie-quick” was increasing. Raw material suppliers wanted to supply lower quality at cheaper price. It was profitable for the company to increase production. Quality department was not happy with the product. Ram met Rahim, the CEO, who, as always, wanted higher profits. He said that IBM will set up a committee for improving the quality. Q. 19. What must not be done by Ram? A. Only produce “quickie-quick” as it gives highest profits. B. Increase the production for “quickie-quick” and ask the supplier for better quality raw material. C. Maintain the level of production for “quickie-quick” and ask the supplier for better quality raw material. D. Reduce the production of “quickie-quick” till committee submits its report. E. Stop production of “quickie-quick” till committee submits its report. Q. 20. Rahim set up a “brand” committee comprising of a few selected managers, headed by Robert. The committee proposed that IBM should continue to manufacture the three differently branded products. It also proposed to recruit a new brand manager for improving brand image of the products. It agreed with Rahim that the company should increase the price. Rocket Singh, head of sales, was confused because he realized that customers were miffed with “run-of-the-mill” and “maxi-max”. What should Rocket Singh do? A. Launch one more product to increase sales. B. Stop production of quickie-quick. C. Launch a campaign on social media to increase awareness about company’s products. D. Send an anonymous email to all the employees highlighting customer dissatisfaction. E. Conduct a research study to find out the reason for customers’ dissatisfaction. Q. 21. Some of the managers in production department were discussing the problems faced in shipping products in time. They complained that they had to undertake responsibility of creating financial and marketing plans in addition to responsibility of production planning. At the same time, finance and marketing managers were to be involved in preparing production plans. It was expected that this will reduce customer complaints. It was rumored that these changes were initiated by the managers educated in the U.S. Which of the following is the best possible course of action available to the affected managers? A. Create a union to safeguard their rights. B. File a law suit against the company. C. Create a forum for discussion and resolution of issues. D. Register a complaint with the human rights body. E. Go for further education to the U.S. Answers Questions 22 to 24 based on the information given below. Rajinder Singh was 32 years old from the small town of Bhathinda, Punj ab. Most of the families living there had middle class incomes, with about 10% of the population living below the poverty level. The population consisted of 10 percent small traders, 30 percent farmers, besides others. Rajinder liked growing up in Bhathinda, where people knew and cared about each other. Even as a youngster it was clear that Rajinder was smart and ambitious. Neighbors would often say, “Someday you’re going to make us proud!” He always had a j ob growing up at Singh’s General Store – Uncle Balwant’s store. Balwant was a well-intentioned person. Rajinder loved being at the store and not just because Balwant paid him well. He liked helping customers, most of who were known by the nicknames. Setting up displays and changing the merchandise for different seasons and holidays was always exciting. Uncle Balwant had one child and off late, his interest in business had declined. But he had taught Rajinder ‘the ins and outs of retailing’. He had taught Rajinder everything, including ordering merchandise, putting on a sale, customer relations, and keeping the books. The best part about working at the store was Balwant himself. Balwant loved the store as much as Rajinder did. Balwant had set up the store with a mission to make sure his neighbors got everything they needed at a fair price. He carried a wide variety of goods, based on the needs of the community. If you needed a snow shovel or piece of j ewelry for your wife, it was no problem – Singh’s had it all. Rajinder was impressed by Balwant’s way of handling and caring for customers. If somebody was going through “hard times”, Balwant somehow knew it. When they came into the store, Balwant would make them feel comfortable, and say something like, “you know Jaswant, let’s put everything on credit today”. This kind of generosity made it easy to understand why Balwant was loved and respected throughout the community. Rajinder grew up and went to school and college in Bhathinda. Later on, he made it to an MBA program in Delhi. Rajinder did well in the MBA course and was goal oriented. After first year of his MBA, the career advisor and Balwant advised Rajinder for an internship at Bigmart. That summer, Rajinder was amazed by the breadth and comprehensiveness of the internship experience. Rajinder got inspired by the life story of the founder of Bigmart, and the values the founder held. Bigmart was one of the best companies in the world. The people that Rajinder worked for at Bigmart during the internship noticed Rajinder’s work ethic, knowledge, and enthusiasm for the business. Before the summer ended, Rajinder had been offered a job as a Management Trainee by Bigmart, to start upon graduation. Balwant was happy to see Rajinder succeed. Even for Rajinder, this was a dream j ob – holding the opportunity to move up the ranks in a big company. Rajinder did indeed move up the ranks quickly, from management trainee, to assistant store manager, to store manager, to supervising manager of three stores, to the present position – Real Estate Manager, North India. This j ob involved locating new sites within targeted locations and community relations. One day Rajinder was eagerly looking forward to the next assignment. When he received email for the same, his world came crashing down. He was asked to identify next site in Bhathinda. It was not that Rajinder didn’t believe in Bigmart’s expansion. What was printed in the popular press, especially the business press, only reinforced Rajinder’s belief in Bigmart. An executive viewed as one of the wisest business persons in the world was quoted as saying, “Bigmart had been a maj or force in improving the quality of life for the average consumer around the world, offering great prices on goods, giving them one stop solution for almost everything.” Many big farmers also benefitted as Bigmart’s supply chain facilities helped reducing the waste. Consumers also benefitted through low prices, as middlemen were removed. At the same time, Rajinder knew that opening a new Bigmart could disrupt small businesses in Bhathinda. Some local stores in small towns often went out of business within a year of the Bigmart’s opening. In Bhathinda, one of those local stores was Singh’s, now run by Balwant’s son, although Balwant still came in every day to “straighten out the merchandise.” As Rajinder thought about this assignment, depression set in, and nightmares followed. Rajinder was frozen in time and space. Rajinder’s nightmares involved Balwant screaming something – although Raj inder could not make out what Balwant was saying. This especially troubled Rajinder, since Balwant never raised his voice. Rajinder didn’t know what to do – who might be helpful? Rajinder’s spouse, who was a housewife? Maybe talking it through could lead to some positive course of action. Rajinder’s boss? Would Bigmart understand? Could Rajinder really disclose the conflict without fear? Uncle Balwant? Should Rajinder disclose the situation and ask for advice? He wanted a solution that would make all stakeholders happy. Q. 22. Who is the best person for Rajinder to talk to? Q. 23. After deliberation with many people and a lot of research, Rajinder came across a study published in leading journal, which stated that most local farmers benefited because Bigmart bought agricultural produce directly from the farmers. Which of the following actions would you prefer Rajinder to take, after he got this fresh information? A. Since farmers benefit from Bigmart’s presence, Rajinder should be happy with Bigmart’s presence in Bhathinda. B. Rajinder should undertake a new study to find out influence of Bigmart on local farmers. C. Rajinder should see this as an opportunity to take concerns of local traders to the top management of Bigmart in India. It may help Bigmart to develop new solutions that can benefit Bigmart, retailers, farmers and consumers. D. Quit job at Bigmart and start another big retail chain to compete with Bigmart. E. Request his boss to transfer him to a new location, which has a low percentage of mom and pop stores. This would reduce Rajinder’s discomfort. Q. 24. Which is the right ascending order, in terms of proportion of population, benefitting from Bigmart, in and around Bhathinda? While these are the complete questions and answers, if you want to prepare for XAT Decision Making for XAT 2019, do have a look at our online course. The online coaching for Decision Making for XAT 2019 contains video solutions to all these questions, videos and presentations for basics concepts, and 100 new questions for practice. Q1. How will I get access to the XAT Decision Making course? Ans: You will get an invitation email within 24 hours. Q2. Till when will the XAT Decision Making course be valid? Q3. Will I be able to download the videos in the XAT Decision Making Course? Q4. I have more questions, what should I do? Q5. What if I don't like the XAT Decision Making course? We provide tutoring in Mumbai, Delhi, Chennai, Pune, Bangalore, Hyderabad, Kota, Jaipur, Bhubaneshwar, Cuttack or any other city from India. We are located in Pune. We offer the best XAT Decision Making Course customized according to your need. Attend Best Decision Making for XAT 2019 Coaching – online from home. Ravi Handa sir is a good explainer and a good motivator too. This was the first live class I have attended. I found it very beneficial and the best online class. Thank you sir for answering even the silly questions. It really helps a lot. Today's class was truly humbling. I thought I knew remainder theorem well. Well, now I know I have a long way to go. Awesome class. Cheers! !